I love scones. Ever since I started dating this guy named Ruark and spent holidays at his parent’s house, they’ve intrigued me. I’d sit drinking tea in the kitchen while his dad, Kevin, worked butter and flour together, the air filling with sweetness while everyone else slowly woke. By the time the fluffy pastries were cooling on the counter, we’d be on our third cup with everyone gathered at the table. I could not eat the scones, but I inherited Kevin’s base recipe, which I’ve adapted over the years in numerous ways. In the next three posts, I’ll be sharing three new scone recipes I brought in miniature form to a benefit for C-CAP, an organization that works with public schools across the country to prepare at-risk high school students for college and career opportunities in the restaurant and hospitality industry. It took a bit of brainstorming to figure out what I wanted my contribution the event, Sweet Sensations, to be. I was the only allergy-alternative baker participating, and so took a quick online poll to find out what kind of treat gluten-free eaters would hope for at a tasting event. When scones won, I did a little happy dance. But I didn’t want to offer just one kind of scone. And I didn’t just want to make a normal batch of scones and cut them into samples. So it gave me a chance to conjure up a few new recipes that could easily be made miniature with a recipe that could provide 20 personal portions and easily be doubled without a problem. I learned quickly that fruit-full scones were out of the question, as the berries were too easily crushed when the smaller size required a bit more handling. So I got my hand around three extremely different flavor combinations that I adore. Especially these ones. Don’t tell my other scone recipes, but this one may be my favorite. Baby Bro managed a few “oh my gods” while his mouth was full. He ate almost half of the batch. My father was curious about the savory aspect, muttering an “they’re edible” before devouring a few more samples, just to “be sure”. I made them again Easter morning to confirm their awesomeness with a large amount of test subjects. They may just be the best scones I’ve ever made. 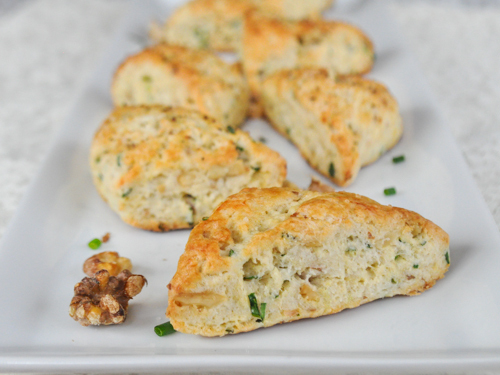 There’s nothing too out-of-the-box about goat cheese, chives and walnuts. But the balance of the three is key; a savory / sweet combo that gets an extra boost by some freshly cracked salt and pepper on top. They’ve got a great crumb, and as you nosh the layers of flavors unravel. They satisfy a morning breakfast pastry without being cloyingly sweet or laden with unhealthy fat. And with freshly toasted walnuts and goat cheese, there’s some gentle protein thrown in there for good measure, too. The other two recipes are quite outstanding, as well, so head back here for my gluten-free, dairy-free Peanut Butter, Banana and Chocolate Chip scones and gluten/dairy/nut-free Classic Lemon Poppy scones. But make these first. Preheat oven to 375. Line a baking sheet with parchment paper or silpat for easier cleaning. *If your walnuts are raw, my favorite way to make them toasty and warm is to break them up slightly and then toast them for about 6 minutes in a toaster oven. Raw nuts are great and all, but toasted walnuts are incredible. Just watch them closely as they go from being underdone to fire-black within seconds. When they’re toasted immediately remove them to a bowl to cool, and make sure they’re completely cool before adding to the mix. In a medium bowl, whisk flours, baking powder and salt. Cut butter into 1/2″ chunks, and toss into flour. With your fingers, quickly and lightly work the butter into the flour until the mixture resembles a coarse cornmeal. Work quickly so that the heat from your hands doesn’t melt the butter – this will help create steam as it melts into the batter and form those lovely air holes and slight crunch. Stir in the white sugar, chives and walnuts, tossing with flour to coat. Add the crumbed goat cheese and toss again. Make a well in the center of the batter and add the beaten egg and 1/2 of the milk. With a fork, start pulling the flour into the wet ingredients, stirring and folding to start to form a batter. If the mixture is already proving to be very dry, add the remaining milk. It should not take more than 1/4 cup milk to get the batter together. When the dry mixture is almost gone, use your hands to gently start kneading the remaining flour in. Work lightly so as to not completely mix in the goat cheese – you want it to remain in clusters as much as possible. Divide dough in half and remove to a floured work surface. Knead a few times until smooth. Roll into a 12″ log and cut into 10 mini scones or 3-4 large scones, then place on baking sheet. Continue with other half. Brush scones with egg white and directly crack on some fresh salt and pepper. 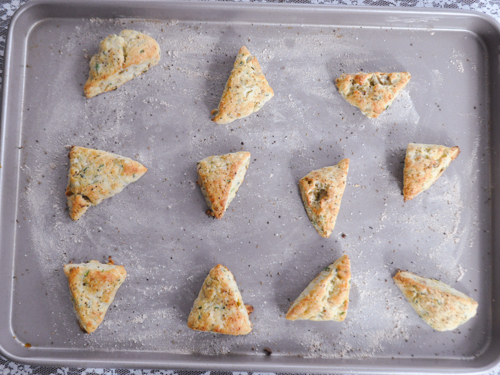 Bake for around 12 minutes for mini scones and around 18 minutes for large scones, until the tops are completely set and golden. These are great both warm and at room temperature. To store, wrap in wax paper (plastic will quickly make them gummy). These sound wonderful! I hope you all have great success at the benefit. These delicious scones were such a hit..and completely “sold out” at the event! 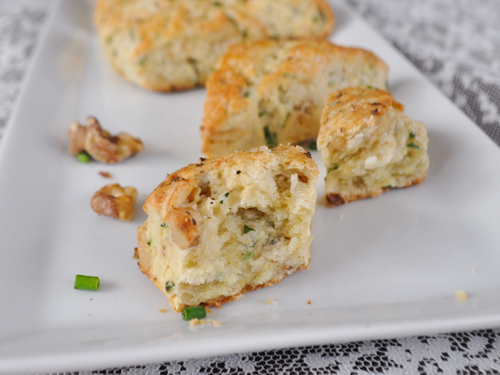 They also inspired me to use chives in my savory scones.